We welcome you to Holy Cross Catholic School (HCCS - Helping Children Confidently Succeed) and to our new Web site. You'll find our beautiful campus in the Northern New Mexico community of Santa Cruz, just 25 miles North of Santa Fe. Here at HCCS, we provide an outstanding Catholic education to students from pre-kindergarten through sixth grade. We're known for our high academic standards, the education in our Catholic faith, supportive community, and commitment to the success of every student. We strive for academic excellence, intellectual growth, and spiritual enrichment. We appreciate your interest in Holy Cross Catholic School. Thank you for visiting our school Web site. It is truly a community resource, full of important information, events, guides, and great opportunities to support our children. 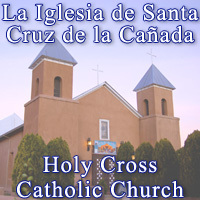 Enlightened by the Holy Family of Nazareth, we at Holy Cross Catholic School, in partnership with parents/families, provide an advanced and faith-based educational experience with an emphasis on the Catholic family values unique to Northern New Mexico. Holy Cross Catholic School will be the premier Catholic Elementary School of Northern New Mexico that prepares students to succeed in their academic, professional and spiritual vocation while utilizing both local and global resources which allow us to excel in our universal community and build strong faith-based families for our society. Since parents are the pirmary educators of their children, we at Holy Cross Catholic School, in partnership with parents/families, provide students with a creative and respectful learning environment, always striving for academic excellence and intellectual growth in the atmosphere of a Christian Catholic Community at work, at worship and at play. By living and learning the Gospel values of faith, service, courage, justice, hope, love and reconciliation, the goal is to transform a person of virtue into a person of Christ. We honor the dignity and importance of each individual and we respect and strive for the autonomy, which enables everyone to be whatever he or she is called by God to be.